Romantic, luxurious, and beautiful, our airy rooms inspire carefree days and nights. While each room is distinctly decorated in the Victorian tradition with fireplaces, antique furnishings, and period pieces, no modern convenience has been overlooked. From air-conditioning, private bathrooms, and flat screen televisions with cable to wireless internet and fax on site, you will not want for a thing. One demonstration of our attention to detail is how we outfit each room with bathrobes and a beach bag with plush towels, sunscreen, and every little thing you need for a day by the shore. With the stylish way we care for all of your needs, the Sarah Kendall House will become your ideal home away from home for every trip to Newport. The Point Garden Room provides its guests with their own porch overlooking our picturesque garden. It has a walk-in shower. 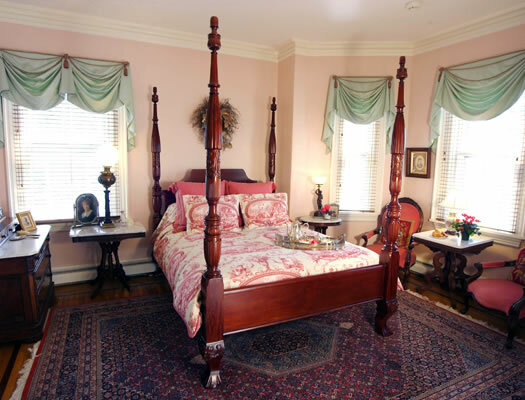 The Sarah Kendall Room is named for the lady of the house and features a queen-size bed, and shower. The Getaway is a quiet getaway with a rooftop view, queen-size bed, and walk-in shower. The Isaac Kendall Room offers a luxurious king-size bed, a shower, and glorious views of the harbor. The Tower Suite on the third floor has it all - a sitting room, a view of the harbor, a king-size bed, walk-in shower, and more! You want your days in Newport to get off to a terrific start and innkeeper and gourmet cook Fran Babcock whips up mouthwatering dishes like eggs benedict, blueberry french toast, and fresh fruit cup served with juices and coffee so delicious that you’ll be pouring a second cup before you open the newspaper. Served on crystal that catches the rays of the sun, antique china, and a gorgeous assortment of platters and pitchers, the dining table is set to dazzle. The hospitality at the Sarah Kendall House continues throughout the day. Afternoon treats are available along with an assortment of refreshments, served inside or out on the expansive front porch overlooking Newport Harbor. The Sarah Kendall House front porch is decorated with wicker chairs and settees, it is the perfect place for watching the sunset.